Photographs of the concrete ruins of the old Sasco copper smelter northwest of Tucson appear in pretty much every book written about the ghosttowns and mining camps of Arizona. I have been by the ruins many times on drives out in that section of desert west of Redrock. 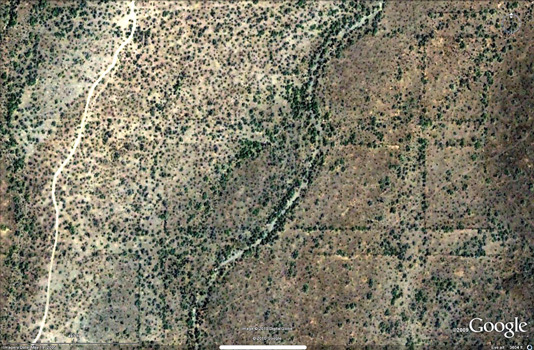 A recent question posted on the Ghosttowns.com forums(A Pinal County Question) asked about lines of rock running across the desert near the smelter. This was news to me. I had never noticed those rock piles. So before I went out to see if I could find the rock lines, for myself, I looked the area over with Google Earth. The pattern that showed up as seen in the photo above was quite striking and quite extensive. GE measures the east-west extent of the pattern for nearly a 1/2 mile. The north-south spread is over 1000'. As for the purpose of the lines and their origin, I really do not know. The pattern looks like to me the lay-out of a potential townsite. As can be seen in the photos, a lot of rocks were stacked in some of the lines; far more than I would have expected to have been needed for survey purposes. The visibility of the lines in the aerial photo is not only due to the rocks, but vegetation that has grown up along the rock lines. Whether intentional or not, the rock lines seem to have served as dams concentrating water flow in the area. The lines occur in several forms: single rocks placed end to end in a very precise manner; similarly placed rock lines with more casually placed rocks thrown alongside; rock lines stacked very high and with very large boulders. I wondered if these various forms represented the different stages in the construction of the lines. By the way, there was no shortage of rocks in the immediate area to be the source of the lines. It is a very rocky area!